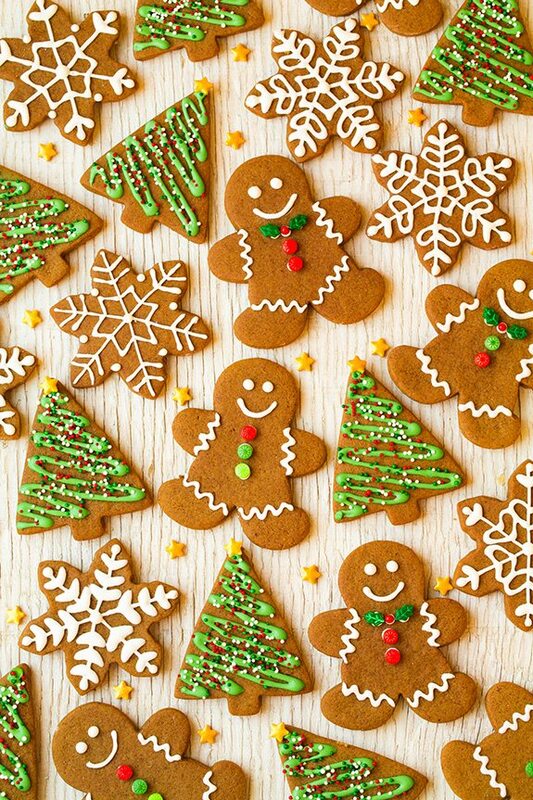 This is my favorite Gingerbread Cookie recipe! It makes perfectly soft and chewy cookies and they have the just the right amount of spices and rich molasses flavor. The dough is easy to work with and they are so fun to decorate. 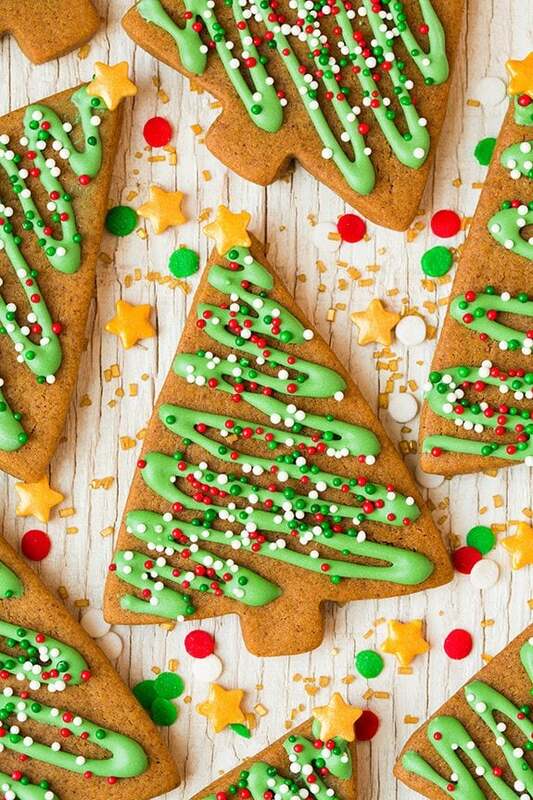 These will quickly become a new favorite holiday cookie! 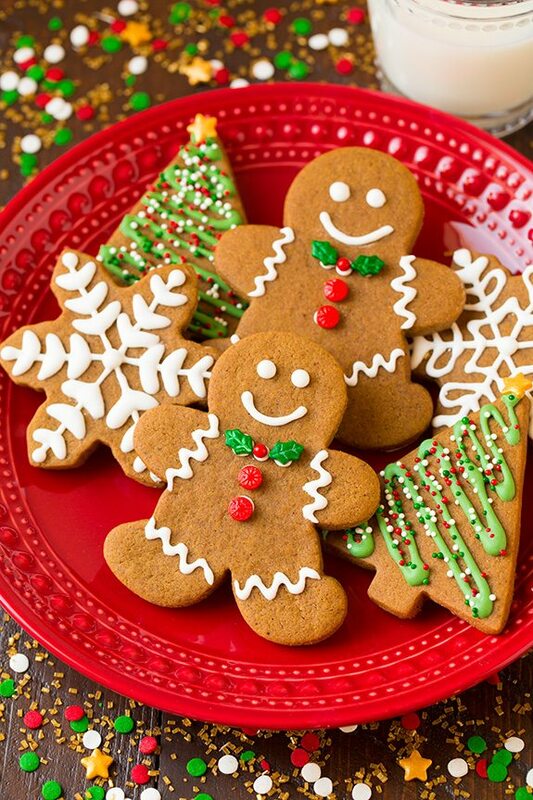 Gingerbread men are such a Christmas classic and it’s about time I finally got around to sharing a recipe! 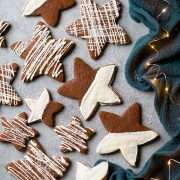 I’ve always loved gingerbread cookies but I’m not so much of a fan of the cracker-like ones so I made these to be a slightly softer cookie. If you do prefer a crispier cookie just roll the dough a bit thinner than listed and even bake a little longer if needed. I made these cookies to be a little more mild on the molasses flavor so they’ll still be kid friendly. You’ll that the dough was easy to work with and doesn’t need a long time to chill. These are so good and definitely a cookie that both young and old alike will love! Where Can I Find Meringue Powder? You can find meringue powder at kitchen supply stores, places like Walmart carry it in their cake decorating section, craft stores like Michaels carry it or you can buy it online. Whisk dry ingredients: In a mixing bowl whisk together flour, ginger, cinnamon, cloves, nutmeg, baking powder, baking soda and salt. Cream sugars and butter: In the bowl of an electric stand mixer fitted with the paddle attachment cream together sugar and butter until well combined. Blend in wet ingredients: Mix egg yolk and vanilla. Mix in molasses and 1 Tbsp milk. Add flour mixture to butter mixture: With mixer set on low speed slowly add in dry ingredients and mix until combined, while adding additional milk as needed just to bring dough together. Roll dough: Divide dough into two equal portions then roll each portion out evenly to 1/4-inch thickness between two sheets of parchment paper. Chill on a cookie sheet in freezer 10 – 20 minutes until firm then cut into shapes using cookie cutters. Transfer and bake: Remove from paper transfer to parchment paper lined cookie sheet and bake in preheated oven minutes until nearly set, about 8 minutes. Cool and decorate: let cool then completely, prepare icing and decorate with icing, let set. If you’d prefer not to make royal icing you could also use a buttercream frosting you just won’t be able to decorate with detail. You could even use a store-bought icing (but keep in mind you won’t be able to stack them). This icing really is easy to make though, the key is just in getting the right consistency so be careful no to add too much or too little water and let it whip up for a fair amount of time until it has a nice sheen to it. Keep in mind it does make a lot of icing so you you are only doing the gingerbread men you would probably only need 1/2 to 2/3 of the recipe listed because they don’t need as much icing as the snowflakes or Christmas trees. Don’t use fully softened butter. The semi-firm butter helps them spread less. Don’t be skimpy with the spices. The amounts listed give them their classic gingerbread flavor. Be sure to chill the dough in the freezer before cutting and shaping, it makes the dough easier to work with. 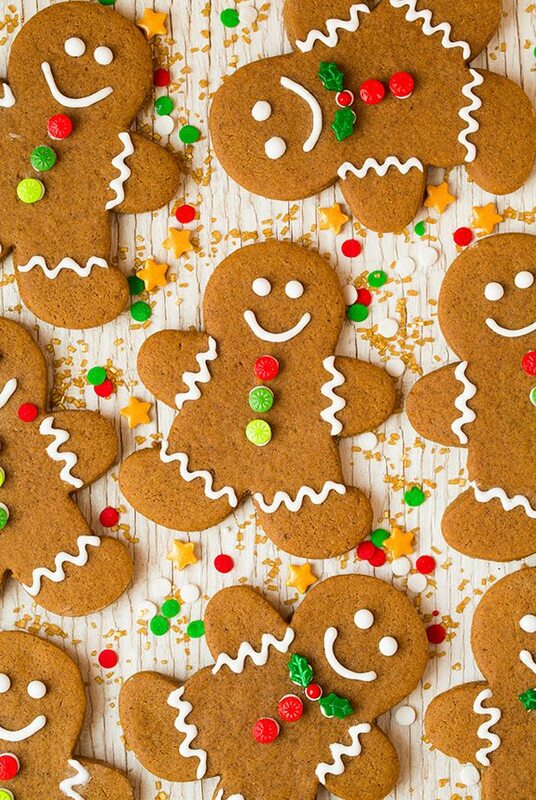 Another fun idea is to turn the gingerbread men upside down and they become shapes for reindeer. I posted a quick how-to video on Instagram here. The reindeer were inspired by Moje Wypieki. 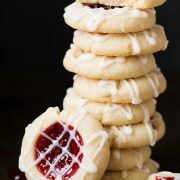 Simply cut dough into circles using a round cookie cutter or biscuit cutter then bake as directed. Pipe the antlers with the dark chocolate as well. Then stick on either a red Sixlet or a mini red M&M for the nose. These cookies were so fun to decorate, every holiday season you need to decorate at least one batch of cookies right? My kids got my first test batch to decorate and I gave them tons of sprinkles to decorate and they were in Heaven! And who doesn’t love the scent of gingerbread cookies baking? It is Heavenly! I hope these make it to your holiday cookie tray! 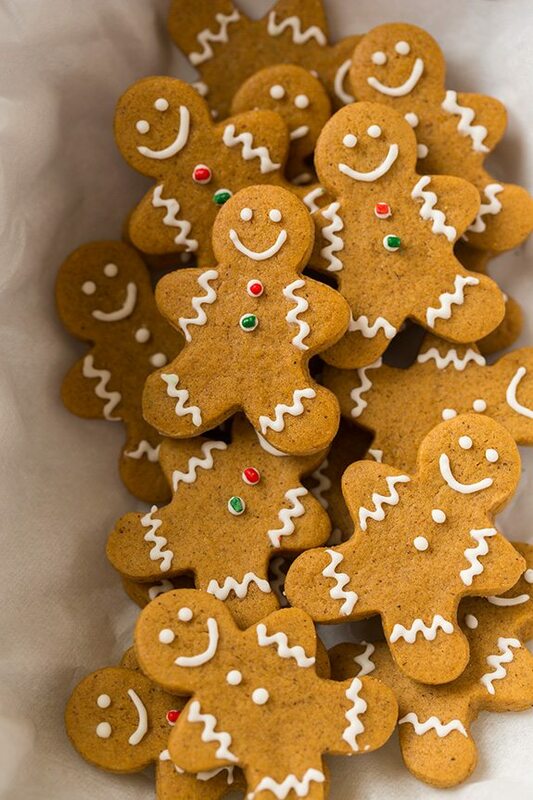 The are such a delicious tradition and we all need a good, reliable Gingy recipe. 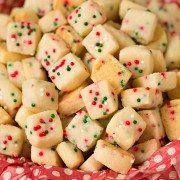 More Christmas Cookie Favorites to Try! Whisk dry ingredients: In a mixing bowl whisk together flour, ginger, cinnamon, cloves, nutmeg, baking powder, baking soda and salt set aside. Cream butter and sugar: In the bowl of an electric stand mixer fitted with the paddle attachment cream together sugar and butter until well combined, occasionally stopping and scraping down bowl. Mix in wet ingredients: Mix egg yolk and vanilla. Mix in molasses and 1 Tbsp milk. Mix dry mixture with wet mixture: With mixer set on low speed slowly add in dry ingredients and mix until combined, while adding additional milk as needed just to bring dough together. Roll dough: Divide dough into two equal portions then roll each portion out evenly to 1/4-inch thickness (into more of a oblong or rectangular shape so it will fit on a cookie sheet) between two sheets of parchment paper. Chill briefly: chill on a cookie sheet in freezer 10 - 20 minutes, or until firm then cut into shapes using cookie cutters. Transfer to baking sheets and bake: Remove from paper using a thin metal spatula or pastry scraper if needed then transfer to parchment paper lined cookie sheet, spacing cookies about 1-inch apart, and bake in preheated oven 8 minutes or until slightly set*. Let cookies cool: Remove from oven and cool on baking sheet 2 minutes then transfer to a wire rack to cool completely. Repeat process with remaining dough. Make the icing: Add powdered sugar and meringue powder to the bowl of an electric stand mixer. Fit mixer with paddle attachment, add in 4 Tbsp water and the vanilla them mix on low speed until combined. Thin as needed and whip: Add more water to thin as needed and increase speed and whip mixture until it is glossy and thickens up. Tint with food coloring if desired. Transfer to piping bags fitted with tiny round tips. 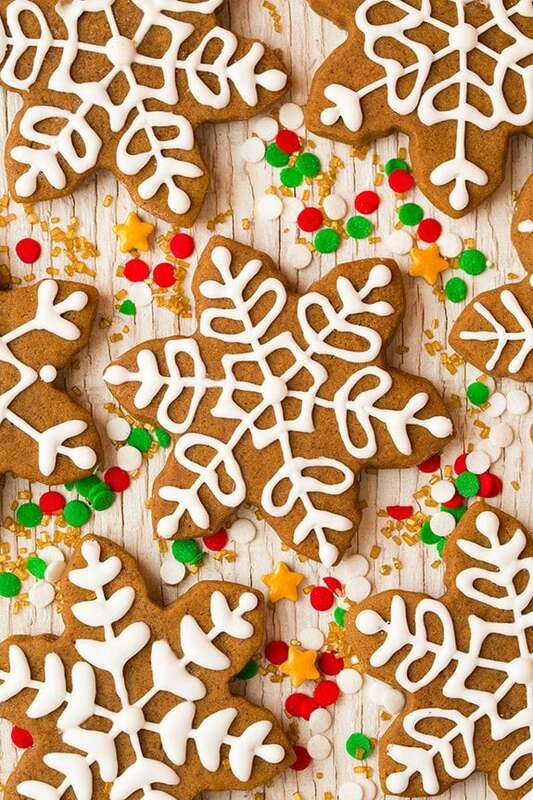 Decorate as desired: decorate cookies with icing and add sprinkles if desired. Let icing set at room temperature and store in an airtight container. *Butter should still hold it's shape pretty well and be cool. The cool butter will make dough easier to work with and make cookies spread less. **Cookies should leave a slight indentation when touched. For soft cookies be careful not to over-bake, if you want them more crisp you can bake longer. Cookies are even better and softer the second day. 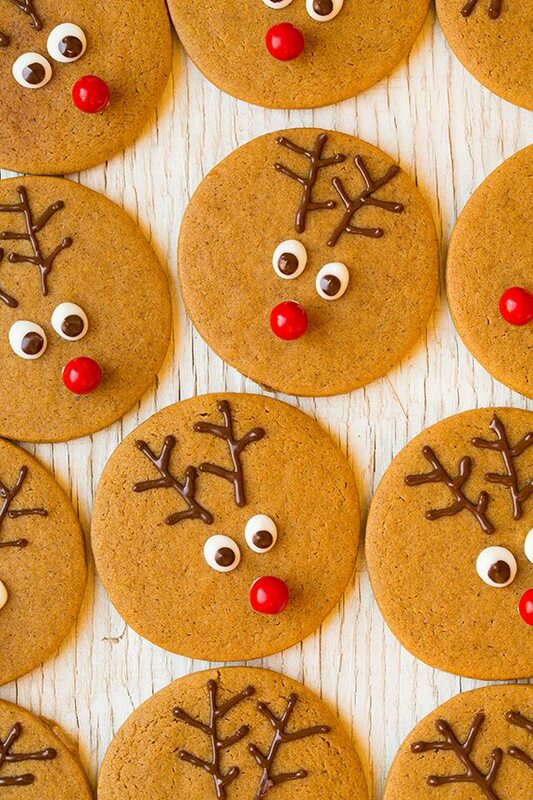 See notes in post above for instructions on how to decorate reindeer cookies.